Young revellers partied long into the night in Accra and Kumasi on 9 December, marking the victory of Nana Addo Dankwa Akufo-Addo with 53.8% of the vote in the presidential election two days earlier. Seconds after the Chairwoman of the Electoral Commission, Charlotte Osei, announced the results to a packed media centre, vuvuzela fanfares blared across the streets of the capital. This was part football cup final – between the Elephants of the triumphant New Patriotic Party (NPP) and the Umbrellas of the defeated National Democratic Congress (NDC) – and partly a power struggle worthy of Shakespeare's kings. Yet contrary to doom-laden forecasts, the results were not decided by youth militias on a Ghanaian battlefield but by a precision-run election, thanks to Osei and her more than 250,000 officials. At almost every stage, the Commission improved on previous elections: getting messages out to the electors; operating the biometric voter registration machines; delivering election materials punctually; ensuring voting secrecy and ballot auditing; transmitting results manually and electronically (although someone launched a successful cyber attack on the Commission's system on the day after polling). The Commission also actively encouraged the big civil society operation led by a 12,000-strong contingent from the Coalition of Domestic Election Observers. There was full cooperation between the Commission and Codeo to produce a parallel vote tabulation based on sample constituencies across the country. It produced estimated results with a variation of less than 0.5% on the final verified results from the Commission. Doubtless, fears of a messy outcome had been stoked by a succession of bad elections in Africa this year and Ghana's deepening economic woes (AC Vol 57 No 24, Jobs and corruption dominate election agenda). All this had turned up the volume on the fierce rivalries between the two main parties. The two leading contenders, challenger Akufo-Addo and President John Dramani Mahama, tried to stand aloof from the mudslinging but their campaign teams showed no such restraint. At one point, Mahama telephoned an opposition journalist to ask his opinion about an attack that accused Akufo-Addo of selling diplomatic passports to a drug-smuggling ring. The journalist told Mahama the advertisement was pernicious nonsense and it was duly taken off the air. Yet a vitriolic campaign by Africa Watch magazine asserting that Akufo-Addo was at death's door afflicted by cancer and heart disease, citing medical records 'stolen' from a west London hospital, was enthusiastically endorsed by the governing NDC. Meanwhile, Mahama's businessman brother and his penchant for private jets and palatial residences in Dubai were the target of many barbs from the NPP. Opinion polls swung back and forth about the likely outcome. None of them came close to predicting what was almost a landslide win by Akufo-Addo, over 900,000 votes ahead of Mahama, while the NPP won a more than 75 seat majority in Parliament over the NDC. With an average turnout of 69% across the country, many traditional NDC supporters failed to come out and many new NPP backers ran to the polls, hopeful of change. So the NPP now has an unquestionable mandate for change. It owes this victory to a combination of savvy tactics, clever policy ideas, good candidates and, most of all, vastly improved organisation. Party insiders say the NPP started its fightback after its defeat in the 2012 elections when it fought an eight-month campaign in the courts to overturn President Mahama's victory. 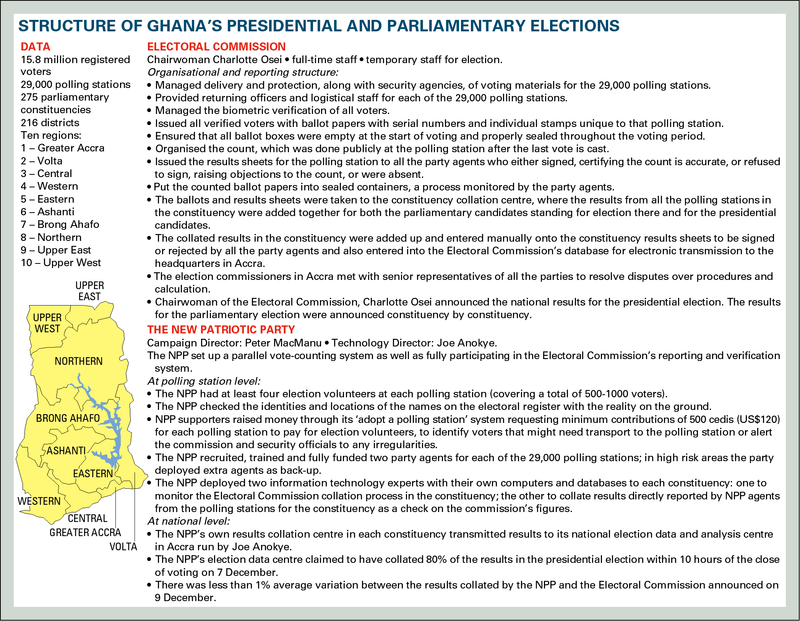 That legal campaign gave the NPP's top officials forensic knowledge of voting patterns across the country's contested constituencies and laid the basis for its campaign for this year's elections. The party's starting point was that its ground game was hopelessly inadequate compared to that of the rival NDC. Although enthusiastic, NPP supporters were disorganised and local officials were slapdash in their recruitment of party workers. In contrast, the NDC had used the advantages of incumbency to the hilt, ensuring that most constituencies had some government projects to brag about and that generous subventions were paid to local party organisations. In response, Akufo-Addo and his allies rebuilt their party organisation with a membership drive. The first step was a much enlarged electorate for the party's primary elections: that ensured that Akufo-Addo could claim support from the more than 100,000-strong electoral college of party members. Then he held out an olive branch to his nearest rival in the party's presidential primaries, former Trade Minister Alan Kyerematen, whose base is in the populous Ashanti region, which has 47 parliamentary seats and over 2.8 million electors. The affable Kyerematen was duly recruited to accompany Akufo-Addo and his running mate, Mahamudu Bawumia from the Northern region, on most of their regional tours. That extended the campaign's reach despite some bitter internal rows in some northern constituencies. Meanwhile, Campaign Director Peter Mac Manu, Akufo-Addo and his cousin, Ken Ofori-Atta, had recruited Joe Anokye, a Ghanaian information technology expert who had worked for the National Aeronautics and Space Administration in the United States for the past two decades. His brief was to set up a parallel reporting system to the Electoral Commission which would allow the party to check the accuracy of all published results against information on the ground. Anokye built his system from the ground up, starting with the recruitment of at least two party agents for each of the 29,000 polling stations; in the most contested constituencies, the party hired three agents. The stipulation was that they must all be fully literate and numerate, fluent in English and at least one Ghanaian language. The party used crowd-funding techniques pioneered by the Barack Obama presidential campaign in the USA in 2008, such as 'adopt a constituency' in which contributors would be asked to give at least 500 cedis (US$122) to fund the party organisation in the most competitive constituencies. From their base, the agents reported the results from each polling station, which the Electoral Commission had to make public, to two data experts working for the party in each of the 275 constituencies. One NPP data expert worked in the party's own constituency collation centre and one in the Electoral Commission's own collation centre in each constituency. From each constituency, the data experts sent through the results on a secure line to the party's 'war room' in central Accra. About eight hours after the close of polling on 7 December, Anokye told Africa Confidential, his team had checked and verified 80% of the results in the presidential election. They gave Akufo-Addo a 10% lead over Mahama which gave the party an inner confidence when the governing NDC claimed that President Mahama was 'cruising to victory'. Opposition parties across Africa and beyond will want to study the NPP's method. The core lesson is that a smart strategy can outwit wealthy incumbent parties but oppositionists still depend on cooperation from the Electoral Commission and a government that will not resort to force to suppress unwelcome results. In a poignant moment at the Electoral Commission headquarters in Accra, some minutes before Chairwoman Osei's announcement of the presidential results, journalists heard that Gambia's President Yahya Jammeh had changed his mind about accepting defeat in the previous week's elections. It was another confusing week for democracy enthusiasts. After 40 years of front-line politics that began with a group campaigning against military rule, 72-year-old Nana Addo Dankwa Akufo-Addo comes to the presidency with a well-thumbed to-do list. His overarching aim is to change Ghana's economic direction from its chronic dependence on commodity exports to become a modern economy led by commercially viable manufacturers, agricultural processing industries and a high-technology service sector. That informed Akufo-Addo's campaign promise of a new factory for each of the country's 216 districts. When asked whether this presupposes a mammoth state-backed industrialisation strategy – of the kind launched by founding President Kwame Nkrumah in the 1950s – Akufo-Addo emphasises 'commercial viability'. Adapting many of his ideas from the successful north-east Asian industrial economies – such as Japan, South Korea and Taiwan – Akufo-Addo talks of Ghana's need for a coherent industrial policy. That means the state building the roads and power stations, then steering private investors to set up factories which can source many of their inputs locally. There are plans for an investment advisory council, both to bring in the capital and to advise on policy and incentives. Much of the nitty-gritty will be handled by Vice-President Mahamudu Bawumia, a former Deputy Governor of the Bank of Ghana (BoG), who will be in overall charge of economic strategy. Also important on economic policy will be the founder of Databank, Ken Ofori-Atta, and his colleague Yofi Grant, who will bring extensive international financial experience to the team. Anthony Akoto-Osei, member of parliament in Ashanti region and a former consultant for the World Bank in South Korea, would provide insights on policy. All three are being mooted as possible finance ministers; Akoto-Osei was Deputy Finance Minister when the New Patriotic Party (NPP) lost power in 2008. Another expert likely to prove important for the new government is Tutu Agyare, the highly regarded managing partner at Nubuke Investment with wide experience in raising finance for emerging market projects. Abdul-Nashiru Issahaku, Governor of the BoG, has come under fire repeatedly from the NPP and business people. Although eligible for at least one four-year term, after being appointed by President John Mahama in March, he could face pressure for an early exit. Aside from mapping a new economic direction, Akufo-Addo's preoccupations will be judicial and constitutional reform, foreign policy and educational development. A former Attorney General and veteran lawyer, he did a five-year stint with New York-based Coudert Brothers LLP in Paris in the 1970s. Akufo-Addo wants to streamline and strengthen the judiciary, which was badly damaged after investigative journalist Anas Aremeyaw Anas exposed widespread corruption on the bench, triggering an investigation by Chief Justice Georgina Wood. Critical to these reforms will be the Attorney General: the frontrunner for that post is Gloria Afua Akuffo, the Deputy Attorney General under the last NPP government in 2001-05 and now handling Legal Affairs for Akufo-Addo's transition team. Also mentioned as a contender in the legal team is Martin Amidu, formerly Attorney General in Mahama's government but sacked after he accused a fellow minister of grand corruption in a cabinet meeting (AC Vol 53 No 3, It's Woyome time). Since then, Amidu has become a whistle blower and anti-corruption activist focusing his efforts on exposing the ties between financier Alfred Agbesi Woyome and the outgoing National Democratic Congress. With strong ties to Nigeria's and Côte d'Ivoire's business and political elite, Akufo-Addo will be able to use his own network to reinforce relations with the two biggest economies in the region. Shirley Ayorkor Botchwey, who is handling Foreign Affairs for the NPP transition team, is also a frontrunner for foreign minister. One of the most popular amd visible NPP politicians, Elizabeth Akua Ohene, known to millions during her years as a senior journalist at the BBC, could be in line for the Education portfolio. Akufo-Addo says he is determined to make good on his promise to provide universal free secondary education. Getting the Treasury to fund that will require all of Ohene's formidable persuasive skills. Prepared for Free Article on 25/04/2019 at 02:56. Authorized users may download, save, and print articles for their own use, but may not further disseminate these articles in their electronic form without express written permission from Africa Confidential / Asempa Limited. Contact subscriptions@africa-confidential.com.